Jesus understood the unique pain of incarcerated men and women when he said, “I was in prison and you didn’t visit me” (Matthew 25:43). Life is difficult in prison. Contrary to popular opinion, it’s not a grand hotel filled with a huge spectrum of benefits. Rather, it’s a collection of broken people filled with a vast array of personal issues. Prisoners face a lot of external pressures every day as they live in an atmosphere of violence, negativity, and boredom. It’s not uncommon to be intimidated or assaulted frequently in a prison. But the internal pressures are worse. Many inmates live with high levels of fear, self-loathing, and hopelessness. Christ loves the prisoner. 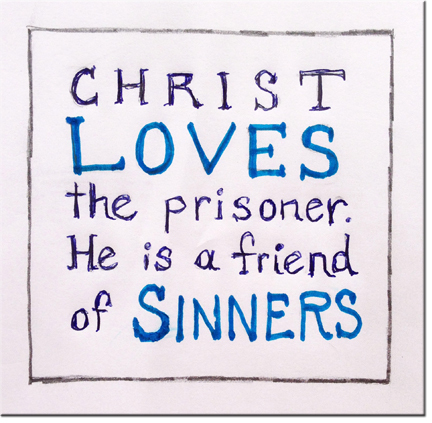 He is a “friend of sinners” (Matthew 11:19). He says to those who are incarcerated: You matter to me. Your life counts. You were created for a purpose. I love you, and you’re incredibly valuable to me. I can forgive you and heal the big hurts inside of you. It’s not unusual to see inmates reach out to God within a few days of their arrest and incarceration. Usually they realize they have lost control of their lives and are willing to turn to God. Is it possible that God is asking you to make a difference in the life of an inmate? In a world where people are beat up and put down, God can give you the power to make a difference. “Whatever you did for one of the least of these . . . you did for me” (Matthew 25:40). 1. Would you consider contacting a local prison ministry to see how you can care for incarcerated men and women? Who could you ask to join you? What gifts could you use to bless those who are in prison? 2. What are some of the barriers that would keep you from serving an inmate or their family? What Scripture could counteract some of these barriers? Brian Brglez is an Alliance Chaplain at Stony Mountain Institution, a corrections facility in Winnipeg, Manitoba. Alliance chaplains are hands-on when it comes to engaging people in need of comfort, love, direction, healing, hope, and encouragement.